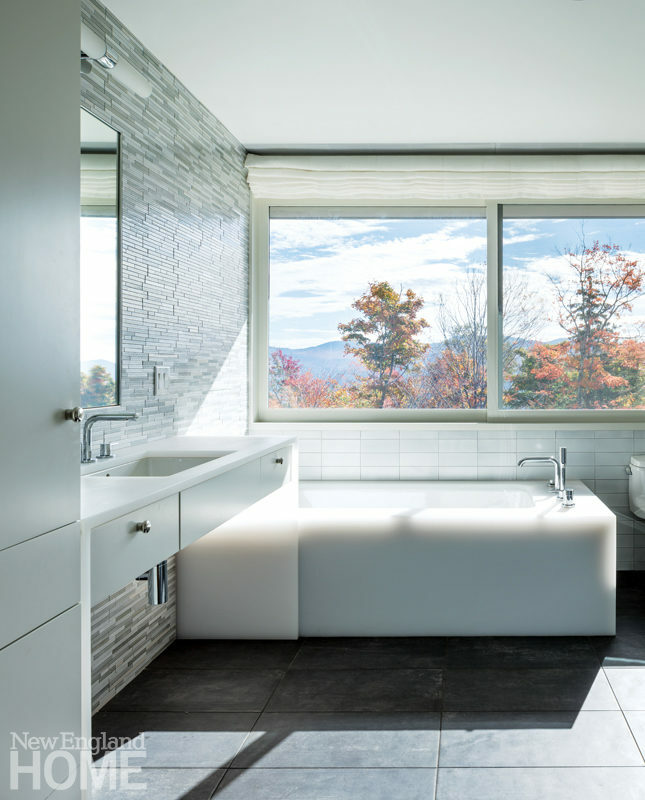 From dawn to dusk, glorious natural light washes every room of a mountainside home in Vermont. In order to maximize sunlight and views in every room, architectural designer Michele Foster kept the footprint narrow. To blend it into the mountain setting, she sheathed it in treated cypress that mimics the color and tone of bark and granite. Careful site selection means the buildings receive sunlight throughout the day. Having separate guest quarters above the garage, to the left of the main house, allows the owners to keep their home cozy for four, but accommodate extra visitors when necessary. Keith Wagner’s landscape design includes lots of stone to help the structures melt into the site. The kitchen’s tall windows slide into the walls, ushering in breezes and blending indoors and out. A trampoline and a chalkboard let the kids’ loft double as a playroom. The master bath’s Dry Ice resin tub from Lightblocks is as stunning as the view. Another boulder taken from the property became a surround for the fire pit. Builder Cleve Patterson says his crew spent weeks excavating rock, much of which was put to good use, like the boulder that serves as the “jumping stone” for the pool. Which is why on a cold February day in 2015, Foster drove for five hours to a fifty-acre parcel in Stowe, Vermont, even though the owners intended to design their house with someone else. She’d worked with them before, she liked them, and no matter who they hired, she wanted the site selection to be right. She arrived to a hillside covered in three feet of snow. So she strapped on snowshoes, tramped up the mountain to the intended site, and said to the husband, Sam, “Look what the sun is doing.” Her topographic maps and sun diagrams flapped in the wind as she pointed out that the house would always be dark in winter, and that the pool would be shaded and uninviting by noon. When she showed him a better site she’d already identified a few hundred feet to the south, Sam decided to hire her instead. Foster now faced a series of design challenges. “The site always has huge impacts on design decisions,” she says, “and it can’t be taken lightly.” No pun intended. Her group tends to design narrow buildings, she explains, because they allow for more light; this house is essentially one room wide, providing light and views from three directions in virtually every room. A stairway with a stainless-steel frame and Lightblocks resin panels leads upstairs to the master bedroom, playroom, and loft space, all under one simple roof line. Vermont can be hot in the summer, however, and all that light can turn a home into a solar oven. Foster used her knowledge of the sun to design overhangs that let in light in the early part of the day, but provide shelter from hot, overhead rays. Floor-to-ceiling windows slide into the walls to produce a porch-like effect with a cross-breeze. The skylight at the top of the stairwell opens, creating a heat chimney like an attic fan. Because air conditioning is rarely needed, solar panels provide most of the electricity. Sam and his wife wanted a house that would accommodate big groups of relatives and friends, but still feel intimate when they were alone with their two kids. Foster designed a main house that’s comfortable for four, with a guest house above the garage that can be closed down or used as needed. The two buildings combine to about 4,400 square feet in a ski town where some new houses are now three times that. Sam says they also wanted “the land to be as much a centerpiece of the project as the house,” and Foster agreed. “No building is as important as the natural environment,” she says. To keep the structure nearly invisible from a distance, they saved as many trees as possible and sheathed the exterior with specially treated siding that mimics the color and feel of weathered barn board or granite outcroppings. Wagner says that’s the best way with any house: “Extend out from the geometry of the design using things like stone walls that blend into the terrain, and then you can soften that with plant materials.” The ground sloped from the top of the pool to the main house, for instance, so he designed a low stone wall that levels and retains the soil, defines separate areas, provides seating during gatherings, and helps link the structure to all the natural stone on site. And there was a lot of stone on site. Builder Cleve Patterson describes it as the most extensive excavation of his career. For six weeks his crews blasted, dug, and hauled out rock. Sam says he knew the location would present unique problems, but he was nonetheless surprised at the number of meetings to discuss how to dispose of all the rock. Wagner and his team found various creative outlets. They installed a “jumping stone” rather than a diving board for the pool, embedded the fire pit into an excavated rock, and built the kids a rock-climbing park by the driveway. The clients wanted their interior rooms to be simple, eco-friendly, and both intimate for small groups and accommodating of larger groups and house concerts. Foster managed this with minimal furnishings that can be moved aside when needed, covered in natural, non-toxic, easily cleaned fabrics. She and her design team washed the oak floors and cypress paneling with a white stain to evoke the bark of the trees outside. Because they collect dust, she eliminated baseboards, requiring meticulous carpentry where wall panels meet the floor.